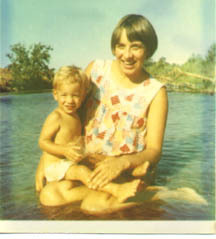 Here's a photo of me sitting in the San Juaqin River with my mom, about 1967. Most recently, my friend Jamison and I climbed to the top of a mountain on Douglas Island on one of our very rare nice days this summer. A few pictures from the summer of 06 (it mostly was rainy and cold, alas). Recently I went to Helena to grab my ailing mother.